National Geographic Children's Books, 9781426333187, 128pp. 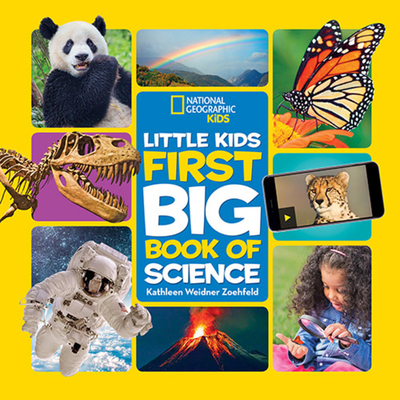 This lively introduction to the fascinating world of science explores the different kinds of science, what scientists do, and the amazing things that scientists study: animals and plants; oceans and space; earthquakes and volcanoes; sound and light; inventions and more! Make sure kids' first experience of the wonders of science is a thrilling eye-opener with this fun reference book. Fun activities, games, and simple experiments encourage interactive learning, showing kids that anyone can use scientific observation and experimentation to be a scientist and discover new things. With bright images and age-appropriate text, this book inspires kids to be curious, ask questions, and explore the world around them and maybe even grow up to be a scientist one day, too! Topics include astronomy, botany, paleontology, malacology (that's the science of clams, snails, and other animals with shells! ), zoology, and more. Kathleen Weidner Zoehfeld is an award-winning author of more than 70 books for children. Her titles include What Lives in a Shell?, winner of the American Association for the Advancement of Science's Best Children's Science Picture Book award; What Is the World Made Of?, a Children's Book-of-the-Month Club main selection; and What's Alive?, also named an AAAS Best Children's Science Picture Book.